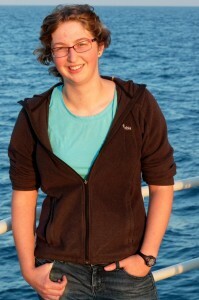 Katie Bigham is a senior studying Oceanography with a biological focus and Earth and Space Sciences. She is fascinated by the extreme environments found on this planet, and the life that manages to survive there despite the punishing conditions. 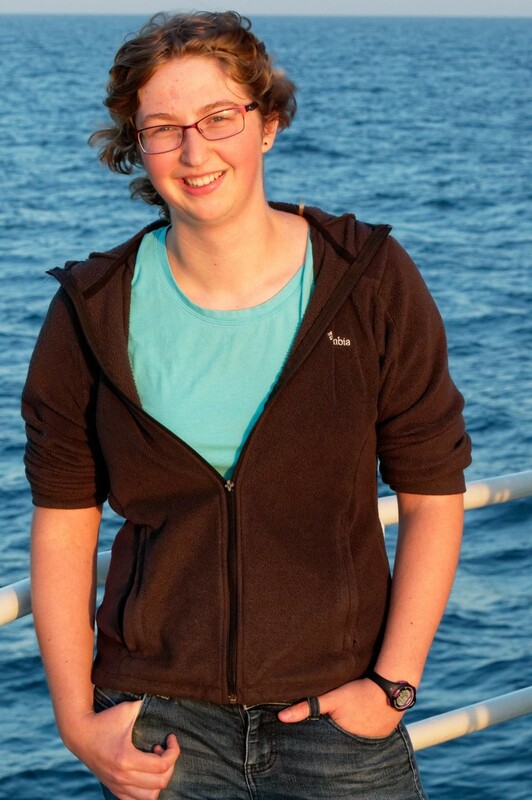 Her current research project with Dr. Deborah Kelley involves understanding the ecology at one of these extreme locales, a methane hydrate seep off the coast of Oregon. The site, Southern Hydrate Ridge, is a designated 25-year study site as part of the National Science Foundation’s Ocean Observatory Initiative (OOI) Cabled Array. Katie’s work to quantify the biology observed before the Cabled Array’s installation and the abiotic factors influencing that life will act as a baseline for the site for years to come. Her undergraduate research has given her the opportunity to participate in three research cruises during the past few summers. The cruises aimed to construct and maintain the OOI Cabled Array. On these cruises a remotely operated vehicle was used to visit Southern Hydrate Ridge and other extreme environments such as hydrothermal vents. These experiences, along with her research, have bolstered her fascination with these demanding habitats. After completing her undergraduate degrees, she plans to continue her education by pursuing a PhD in oceanographic sciences. She hopes to do further research on the extreme environments of our planet, and someday be the principle investigator of her own lab. She is extraordinarily grateful towards the Washington Research Foundation for their assistance in meeting her academic and professional goals. Abstract: Deposits of methane sequestered along continental margins and their associated seeps are found worldwide. These seeps are of increasing interest and importance because of their potential as an energy source, their contribution to greenhouse gases, and the unique community of chemosynthetic microorganisms and fauna that they host. One of the best-studied methane seep sites is Southern Hydrate Ridge, which is at a water depth of ~800 m. It is located ~90 km west of Newport, Oregon. Despite extensive geophysical and biological research completed here, no studies have quantified the relationship of seep sites and seafloor geology to the spatial distribution and abundances of microbial and macrofaunal communities. High resolution, georeferenced photomosaics of the individual seeps and the associated biological communities at this site were collected in 2011, using the remotely operated vehicle ROPOS.Detailed analyses of these images has allowed for the quantification and characterization of the diversity and structure of the faunal community. Results show that both the distribution and abundances of seep organisms are highly variable. Further examination of these photomosaics may improve understanding of the relationships between faunal distributions and seep locations, with implications for the impacts that chemical gradients have on these ecosystems. Rian Chandra is a senior in the Interdisciplinary Honors program, majoring in Physics, and Applied Mathematics and Computational Sciences. He has worked for the past three years at the HIT-SI3 plasma physics lab, under Professor Tom Jarboe. The lab studies a novel technique to confine a plasma in steady state, for fusion power applications. His research has focused on optical diagnostics, primarily the lab’s Ion Doppler Spectrometer, which measures ion temperature and velocity in the plasma, through the Doppler broadening and shift respectively of impurity spectral lines. His current project is the implementation of various hardware and software upgrades, carried out over the past year, which afford a more complete 2D picture of the highly 3D spatial and temporal dynamics. These improvements will be applied to data from the lab’s current high-performance run campaign, with the goal of characterizing the nature and stability of the plasma. Experimental plasma research, as a frontier engineering-physics discipline is intrinsically interdisciplinary, and Rian has found that the creativity that questions in this research demand make each step of the process novel and exciting. Abstract: The ability to simultaneously confine and heat ions is central to sustained, viable fusion energy. The HIT-SI plasma physics experiment at the University of Washington has previously demonstrated the best persistent stability of any similar geometry experiment to date. Key to this success was the discovery that heated ions were undergoing coherent motion, locked to “rigid” magnetic field lines. This discovery was possible through the use of an Ion Doppler Spectrometer (IDS), which measures the Doppler shift and broadening of impurity spectral lines in the plasma. No-one has yet demonstrated this on the latest iteration of the experiment, HIT-SI3. My largely independent work over the past year has yielded a way to, in a more quantitative manner, describe the bulk modal activity of the ion motion and temperature. The use of two fiber-optic bundles offset by 90 degrees which span the machine midplane, one in a new port I constructed, allow the plasma’s bulk motion to be described by the relative temporal phase of the line integrated velocity between spatial channels. With this new analysis technique, I have found complex dynamics which could not previously be deconstructed (and have not been previously described with an IDS instrument), in which the plasma toroid (of carbon ion temperature <20eV) may be rotating in a stable motion (<5km/s), while simultaneously executing an (R<4cm) orbit about the center of the vacuum vessel. The experiment has recently unlocked a new, high-performance regime, rivaling that achieved on HIT-SI. I will apply this analysis to both the new data and simulation data to attempt the reproduction of previous results seen on HIT-SI, and to characterize the current ion temperature and velocity dynamics. If time permits, these dynamics will be investigated at higher time resolution with a Shimadzu HVP-X fast camera. Ian Christen is a Senior at the University of Washington majoring in Physics and Mathematics. 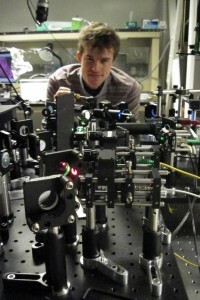 He works in Kai-Mei Fu’s Optical Spintronics and Sensing Lab as part of her Quantum Information Processing (QIP) Project. The aim of this project is to develop an integrated photonics platform for scalable quantum computation using nitrogen-vacancy (NV) centers in diamond. The NV centers can store information, acting as quantum bits (qubits). A gallium phosphide photonic circuit fabricated on top of diamond collects, routes, interferes, and measures single photons from near-surface NV centers. This process produces quantum entanglement between NV centers, which is essential for quantum computations. The end-goal of this project is to develop a device which is essentially a dynamo for entanglement. Effects such as the electromagnetic functions in diamond change the emission frequency of NV centers and prevent entanglement. So far, Ian’s research has involved the parameterization and correction of NV center optical emission. Specific projects include: (a) the construction of a tunable-frequency laser to precisely determine the frequency of NV optical emission, along with two methods to correct frequency shifts: (b) annealing diamond to high temperatures (1200C) to remove electrically-active defects near NV centers and relax strain in the diamond and (c) fabricating nanoscale gold electrodes around NV centers to apply correction electric fields. WRF funding (last year) allowed him to build these gold electrodes at the on-campus Washington Nanofabrication Facility and successfully demonstrate frequency correction. This year, he will continue his previous research and examine additional methods to correct errors elsewhere in the system, specifically fabrication error in the photonic circuit. After graduation, he plans to pursue a PhD program in Physics. Outside of school, Ian enjoys running, swimming, and competing in triathlons. Abstract: The nitrogen-vacancy (NV) center is a defect in diamond with interesting quantum properties. The NV center can be used as a qubit (the quantum equivalent a classical bit) for quantum computation. For certain difficult applications, such as simulation, optimization, and factoring, a quantum computer could realize significant performance increases over classical efforts. The operation of such a computer depends on the ability to create quantum entanglement between NV centers. For entanglement to be established, the optical transitions of two NV centers must be indistinguishable. However, due to the non-ideal nature of reality, the local environments of NV centers are not homogeneous and the frequencies of the optical transitions are thus distinguishable. This research aims to mitigate this error by applying electric fields to controllably tune the frequencies of NV transitions via the Stark effect. A major result will be the tuning of NV transitions to a resonant cavity. Quynh Do moved from Vietnam to Portland, Oregon with her parents and sister three years ago. After getting her Associates of Art degree from Portland Community College, Quynh transferred to the University of Washington (UW) and is now a senior double majoring in both Biochemistry and Chemistry. She is working in the Luscombe lab in the department of Materials Science and Engineering on new materials for organic solar cells. The field of organic electronics has grown at a significant rate due to its advantages compared to inorganic electronics such as silicon-based devices. Organic materials are not only more flexible than silicon but also more sustainable as it can be synthesized from Earth abundant and cheap raw materials. Her project focuses on solving the financial and environmental costs associated with the syntheses of π−conjugated polymers used as materials for organic solar cells through developing new coupling techniques. As conventional cross-coupling techniques involve the usage of expensive and toxic materials, direct cross-coupling reactions via carbon-hydrogen (C-H) bond have emerged as an attractive synthetic route toward π−conjugated polymers. Ultimately, not only solar cells can be produced in fewer steps, but its production will also be more environmentally friendly. Being the first generation in a low-income family to attend college, Quynh hopes to set a new pathway for the younger generation in her family. 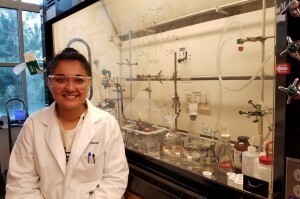 Her goal after getting her bachelor’s degree is to attend graduate school in a Ph.D program, potentially in Organic Chemistry or Medicinal Chemistry. Quynh’s career goal is to become a professor since she wants to inspire students, especially women, to follow their dream and to pursue a career in science. Abstract: The field of organic electronics has grown at a significant rate due to its advantages compared to inorganic electronics such as silicon-based devices. Organic materials are not only more flexible than silicon but also more sustainable as they can be synthesized from Earth abundant and cheap raw materials. Current research in the field emphasizes on improving the efficiency of three main applications: displays and lighting, transistors, and solar cells. This project focuses on solving the financial and environmental costs associated with the syntheses of π−conjugated polymers used as materials for organic solar cells through developing new coupling techniques. Cross-coupling reactions are those that combine two starting materials into one compound through new carbon-carbon (C-C) bond. Kumada, Stille, and Suzuki couplings are the most commonly used reactions in synthesizing organic polymers. Despite their effectiveness in creating new C-C bonds between the monomers, these reactions involve the use of expensive and toxic materials. Moreover, it takes more steps to derive halogenated or organometallic monomers. Therefore, direct cross-coupling reactions via carbon-hydrogen (C-H) bond have emerged as an attractive synthetic route toward π−conjugated polymers. C-H bond is usually inert under normal conditions. However, if the bond can be activated and becomes more reactive, we can eliminate the use of the conventional reactions mentioned above. Ultimately, not only solar cells can be produced in fewer steps, but its production will also be more environmentally friendly. The main goal of this project is to synthesize π−conjugated polymers that can efficiently serve as materials for organic solar cells via C-H activation. To achieve this goal, the project is separated into three stages. First, a benzobisoxazole-based monomer is designed and synthesized. Second, reaction conditions are developed to activate the monomer’s C-H bond. Last, the polymers will be synthesized and its ability as materials for organic solar cells will be analyzed. 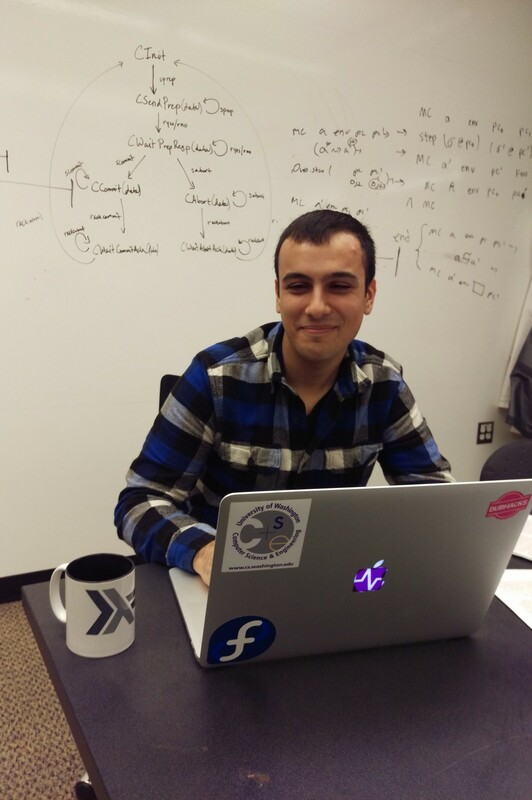 Payam Farahani is a Senior studying Chemical Engineering with a focus in Nanoscience and Molecular Engineering. His interests lie in biomaterials and their applications in tissue engineering and regenerative medicine. Payam’s research focuses on a class of biomaterials known as hydrogels, water-absorbent polymer networks widely used as 3D cell culture platforms. His fascination with these materials began in the Fall of his Sophomore year, when he began his first research experience with Professor Shaoyi Jiang. Working in the Jiang Group, Payam developed protocol to 3D print hydrogels by means of light-based polymerization. In the Fall of his Junior year, he translated the knowledge from his 3D printing project to his current research. Payam is working with Professor Cole DeForest to develop user-programmable hydrogels able to spatiotemporally guide cell behavior. This is achieved through a light-driven reaction known as photo-mediated oxime ligation. Payam is applying this chemistry as a novel method for forming and mechanically modifying hydrogels. Using the same chemistry, he is exploring strategies to pattern proteins throughout hydrogels with micron-scale resolution. By harnessing this technology’s mechanical and biochemical modification strategies, Payam intends to predictably guide stem cell behavior within well-defined, hydrogel-based environments. 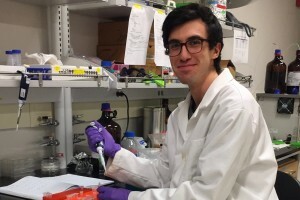 Following graduation, Payam plans to pursue a Ph.D. in Chemical Engineering in order to use biomaterials to further our understanding of stem cell and cancer biology. Outside of the laboratory, Payam enjoys skiing, climbing, hiking, and participating in scientific outreach. Payam would like to express his gratitude to the Washington Research Foundation for supporting his research endeavors. Abstract: Water-swollen polymer networks known as hydrogels are attractive materials from which functional tissues and organs could be developed using patient-derived stem cells. While hydrogels demonstrate biocompatibility conducive to harboring cells, they lack mechanical and biochemical aspects of the native extracellular matrix (ECM), the intricate microenvironment about which cells function. Moreover, common methods for hydrogel formation jeopardize cell viability, where free radicals present during polymerization are prone to side-reactions with encapsulated cells. We aim to recapitulate the complexity of native tissue while avoiding deleterious effects of radical-based polymerization, by developing a light-based strategy for hydrogel formation and modification known as photo-mediated oxime ligation. Photo-mediated oxime ligation’s high selectivity minimizes side-reactions in the presence of cells. Moreover, the same photo-driven oxime chemistry can immobilize proteins with 3D resolution, providing a biochemical handle for directing cell fate. Preliminary studies have shown successful gelation of oxime-based hydrogel solutions within ten minutes of UV light exposure. Site-selective UV irradiation additionally yields control over the location and extent of polymer crosslinking; physical factors influencing cell behavior. Moving forward, I plan to quantify mechanical properties with varying UV exposure durations and intensities to systematically tune hydrogel stiffness. I then aim to demonstrate protein patterning within oxime-based hydrogels using site-specifically modified green fluorescent protein and RGDS peptide sequences. Following this cell culture platform’s development, human mesenchymal stem cells encapsulated within oxime-based hydrogels will be predictably guided in their migration using patterned RGDS in combination with spatially-varying hydrogel stiffness. We expect hydrogels formed and modified by photo-mediated oxime ligation will open doors to elucidating stem cell biology in an environment rivaling the complexity of the native ECM. In turn, an improved understanding of stem cell behavior will serve to advance the clinical translation of stem cell-based therapies in regenerative medicine. Hyeon-Jin Kim is a junior majoring in chemistry and biochemistry. 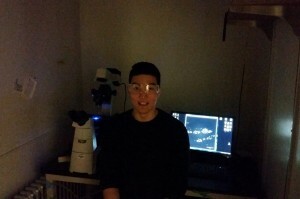 In the spring quarter of his freshman year, he joined the Vaughan Group to help enhance super resolution techniques for bioimaging. His previous work involved developing methods that enable Expansion Microscopy with conventional antibodies and fluorescent proteins. Currently, he is collaborating with the Parrish Group from the Department of Biology to help them study dendrite-epidermis interactions in Drosophila. The goal of this project is to extend the applications of Expansion Microscopy and use it as a tool for examining Drosophila tissues in super-resolution. Hyeon-Jin has deep interest in math and is also considering majoring in Applied Computational Mathematical Science (ACMS). After he graduates, he plans to attend graduate school to study biological chemistry and to eventually pursue a career in academic research. Hyeon-Jin would like to thank everyone in the Vaughan Group and his collaborators for their help and support. He is honored to be a Washington Research Foundation Fellow and appreciates the generosity and support from the WRF. Abstract: Expansion Microscopy (ExM) is a newly developed fluorescence microscopy technique that enables super-resolution imaging of fixed specimens that have been chemically incorporated into a hydrogel polymer matrix, enzymatically digested, and physically expanded. This technique yields expansion of ~4x along each x/y/z axis and a spatial resolution of ~70nm. The original ExM approach utilized special tri-functional antibodies containing a DNA-dye-linker complex to attach the fluorescent dyes to the expandable polymer. Recently, our group have created a simplified ExM protocol, using conventional antibodies, fluorescent proteins, and a variety of commonly available reagents yielding increased fluorophore retention for cultured cells and tissue specimens. In this project, I aim to extend this new approach of ExM to model organisms, putting the focus on Drosophila melanogaster. So far, I was able to modify our existing ExM protocol and enable ExM of Drosophila tissues including larva, embryo and brain tissues. I am currently working on validating the uniformity of expansion via correlative data analysis using a programming software called Elastix. Once the protocol is validated, I plan to use this technique to study the synaptic structure and dendrite cell-epithelial cell interactions in Drosophila with our collaborators. In the long-term, I wish to use a similar approach to apply ExM to C. elegans as well as try to increase the brightness of signals using brighter fluorescent probes. 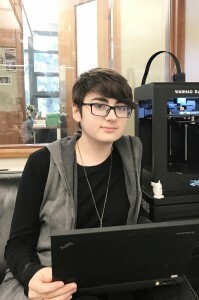 Starting her education at the UW as a pre-med student, Melissa Medsker-Galloway is now a senior in the Computer Science and Human-Centered Design & Engineering Departments, having found an unexpected passion for computer science after taking her first programming course at UW. She has since been involved in undergraduate research with Professor Zachary Tatlock of the CSE PLSE (Programming Languages and Software Engineering) Lab, driven to find solutions to real-world problems using computer science. 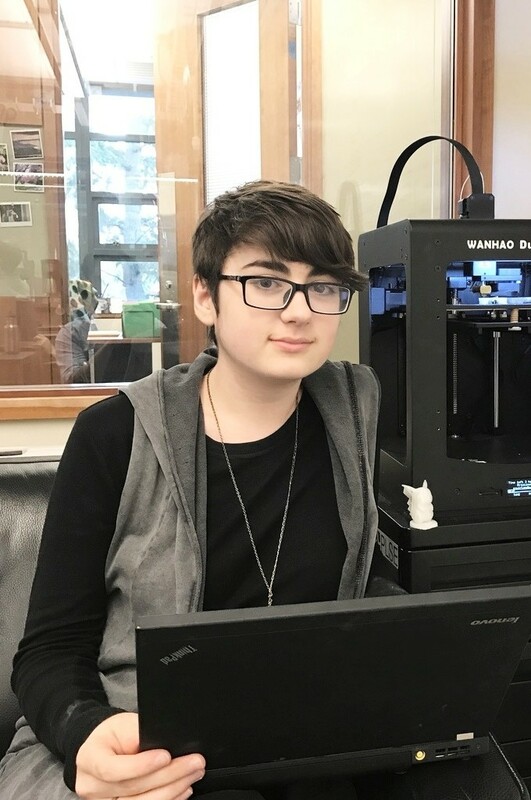 Under Tatlock’s mentorship, she has been working on improving current 3D Printing technologies through software development and program verification, and has found research to be invaluable in expanding her interests in the field. Outside of her work in the PLSE lab, she has been involved in various educational technology projects, using her interests in teaching computer science and her HCDE coursework in user research and interface design to help develop solutions to improve student learning and assignment feedback. After completing her undergraduate studies in CS and HCDE, she hopes to pursue the UW CSE Master’s program to continue exploring different areas of computer science and apply them to her research interests in programming language design and implementation, educational technology, and computational protein-folding and optimization. 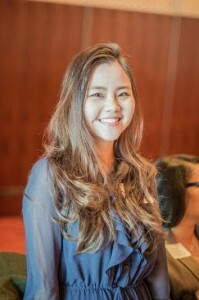 Ultimately, she hopes to pursue a teaching career at a research-based university where she can both teach and research in the field of computer science. Melissa is extremely grateful for the support of her research mentor Zachary Tatlock, who has provided invaluable perspective, wisdom, and advice throughout her transition from pre-med studies to computer science, and inspiring her to continue pursuing her research during and beyond her Undergraduate studies. In addition, she would like to thank the PLSE graduate students who have welcomed her into the CSE research community and have provided additional advice and insights. Lastly, she would like to express her gratitude to the Washington Research Foundation for providing the opportunity to continue her undergraduate research and education at the UW, and reinforcing her goals to continue her education and research in computer science post-graduation. Abstract: Additive manufacturing – the process behind 3D printing – has been growing in widespread use since the introduction of the first commercially-available desktop printer and later improvements in cost, quality, and accessibility. Expanding horizontally and vertically in the global market, the 3D printing industry has been one that not only appeals to hobbyists, but has demonstrated potential as a solution to a variety of challenges faced around the world today, including those in biotechnology, aerospace, and industrial engineering. Seeking to take advantage of the increasing demands in 3D printing technologies, a number of companies and open-source organizations are offering new types of 3D printers and associated software. However, the rapid growth and diversity of the products being released have resulted in a loss of universal standards. Often indented to be accessible and reliable regardless of a user’s technical background, 3D printing technologies have been known to require consumers to learn the more technical aspects of their printer, G-Code, slicing software, materials, etc. in order to configure their overall setup and reduce the prevalence of errors. Project Incarnate aims at using advanced parsing strategies, program optimization, and statistical analysis to provide a universal, easy-to-use tool that both analyzes and optimizes G-Code files prior to printing. By automating the common fixes users are required to implement in their G-Code files and identifying common factors in 3D prints (material warping, inadequate temperatures, speed of extruder heads, etc. ), this tool is intended to be usable for any consumer, regardless of engineering or design experience. Ultimately, our goal is to help provide a universal solution to the lack of consistency between products, and help leverage the promising field of 3D printing to reach its potential as both a home essential and reliable solution in fields such as biotechnology and industrial engineering. Manuja is a senior Electrical Engineering student at the University of Washington, Bothell, who has been working on her undergraduate research project since Fall’15 with mentor Dr. Hung Cao. She is a transfer student from India who joined UW Bothell as a junior in Fall’2015 and who will be graduating in summer’2017. Manuja was motivated by personal health issues to research in the field of bio-medical devices. She is working on an algorithm to correlate blood pressure and parameters derived from bio-signals, as well to develop efficient wireless communication between the wearable device and smartphone/PC, currently working to incorporate Bluetooth technology in the BP device. Manuja recognizes her mentor for being very encouraging and helping her better understand the nuances of the research world. Manuja wants to pursue a Ph.D. in EE with a focus on bio-electronic circuit designing and will be applying to graduate schools for Fall’2017 admission. She would like to express her gratitude towards Washington Research Foundation for awarding her the fellowship. Abstract: Hypertension is a life-threatening issue affecting 31% American adults and demands close monitoring. All conventional Blood Pressure (BP) devices are cuff based and are inconvenient to wear and fail to provide continuous BP. There is a need for a convenient, miniaturized, and cuff-less blood pressure (BP) monitoring device. During the past several years, studies have shown that BP is correlated to pulse transit time (PTT) obtained from electrocardiogram (ECG) and photoplethysmogram (PPG) or radial pulse. Many research groups have attempted to develop a cuff-less device based on PTT but most of them require cross body ECG electrodes hindering the development of a continuous device. My team under Dr. Cao’s guidance has successfully demonstrated that same side ECG and PPG can be used to obtain PTT that correlates inversely with BP, hence paving the way for a continuous device. But the relationship between PTT and BP is dependent on many other factors like age, thickness of arteries and heart rate making it difficult to use an algorithm relating BP and PTT without frequent re-calibration. I have been working extensively to develop an algorithm that can predict BP accurately with minimum re-calibration as many influencing factors can be obtained from PPG or radial pulse signal. To enable mobile-health monitoring I have been developing a wireless module that connects our device with a desktop and smartphone. Finally, my team aims to build the whole device on a flexible substrate making it comfortable to wear. The research project has been presented at UW Bothell symposium and will be part of BMES 2016 poster presentation as well. A paper describing our novel device model and its accuracy in relation to BP has been accepted for IEEE Sensors 2016. 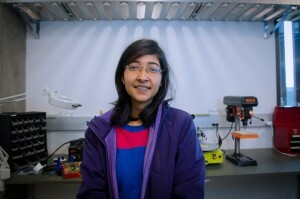 Zoha Syed is a senior majoring in chemistry and biochemistry at the University of Washington. Her interest in chemistry began as a freshman in Professor Philip Reid’s CHEM 142 class, after which she joined Professor Gojko Lalic’s research lab in the UW Department of Chemistry in June of 2014. There, she was first introduced to transition metal-catalyzed reactions used to functionalize organic molecules. Wanting to learn more about catalysis, Zoha joined Professor Karen Goldberg’s research lab in the UW Department of Chemistry in June of 2015. Professor Goldberg is the director of the Center for Enabling New Technologies through Catalysis (CENTC), a National Science Foundation Phase II Chemical Bonding Center, which includes 10 institutions across the United States researching new catalytic transformations. In the Goldberg lab, Zoha’s research focus is alkane functionalization using iridium catalysts. Alkanes possess chemically-inert C-H bonds, which are very difficult to functionalize. Transition metal catalysts, as a result, must be used to conduct these transformations. In her undergraduate career, Zoha has had the opportunity to conduct and present her research around the country. In the summer of 2015, she was a CENTC summer undergraduate research fellow in the lab of Professor Alan Goldman at Rutgers University in New Brunswick, NJ, studying alkane dehydrogenation using iridium catalysts in collaboration with Professor Goldberg. Zoha also presented her research at the 251st American Chemical Society National Meeting, in San Diego, CA. Recently, Zoha was awarded honorable mention for the 2016 American Chemical Society Division of Inorganic Chemistry Award for Undergraduate Research, and will be presenting her work next spring at the 253rd American Chemical Society National Meeting, in San Francisco, CA. Zoha is grateful to her labmates and her PI Professor Goldberg and her mentor Dr. Ash Wright for their guidance and support throughout her time researching in the Goldberg lab. In addition, Zoha would like to thank Erin Hanada, Jeremy Tran, Amanda Qu, and Grace Chen for helpful discussions. After she graduates, Zoha hopes to pursue a career in research. Abstract: Alkanes are the major constituents of natural gas and petroleum. The development of catalysts for the efficient and cost-effective catalytic conversion of alkanes to functionalized organics is highly desirable. Previously, Nishiyama and coworkers found that the IrIII complex (dmPhebox)Ir(OAc)2(OH2) (Phebox = 3,5-dimethylphenyl-2,6-bis(oxazolinyl)) could activate the C-H bonds of n-octane at high temperatures under nitrogen. Goldberg and coworkers found upon increasing the temperature, β-H elimination could be promoted, giving isomers of n-octene. Reactions of similar Ir complexes with alcohols, ketones and other organic substrates will be presented. 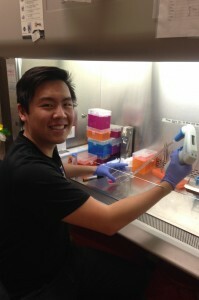 Connor Tsuchida is a senior majoring in Bioengineering at the University of Washington. After exploring the fields of civil engineering, global health diagnostics, and pharmaceutics, he eventually found his passion for tissue engineering in Dr. Ying Zheng’s vascular engineering lab. With the support of this fellowship, he is striving to develop a kidney-tumor-on-a-chip in order to accelerate drug discovery and development. In addition to his research, Connor is active in the Bioengineering Department as the President of the Biomedical Engineering Society and the Co-Founder/Editor-in-Chief of Denatured Magazine. Connor also serves the College of Engineering as a member of the College of Engineering Student Advisory Council. After graduating this spring, he hopes to pursue a PhD in Bioengineering and continue to conduct tissue engineering research. Eventually, Connor aims to become a professor, allowing him to continue advancing the field of bioengineering as a leader in the lab and the classroom. Connor would like to acknowledge the incredible support from his mentors Dr. Ying Zheng and Dr. Chris Miller. Additionally, he would like to express his extreme appreciation to the Washington Research Foundation for investing in his future in medicine and engineering. Abstract: In the United States, cancer is responsible for a staggering 1 in 4 deaths. As the second leading cause of mortality nationwide, there remains an immense need to develop new cancer-curing therapeutics. A major barrier in the development of new therapeutics is the models used for testing. 2D cell cultures lack sufficient complexity compared to in vivo and animal models have inherent genetic and cellular differences from humans, making both poor predictors of drug efficacy in cancer patients. To address this problem specifically in kidney cancer, a prevalent yet underfunded cancer, I propose the development of a kidney-tumor-on-a-chip to mimic the tumor-vessel microenvironment in vitro. Tumors induce angiogenesis, the sprouting of new vessels, to feed the existing tumor and create pathways for metastases. Aiming to starve the tumor or prevent metastases, this relationship is highly targeted by emerging cancer therapeutics. Developing the kidney-tumor-on-a-chip will involve creating a collagen microchannel seeded with human kidney endothelial cells, producing a tissue-engineered blood vessel. Renal cell carcinoma cells, the most prevalent type of kidney cancer, obtained from UW Medicine patients will be formed into spheroids to mimic cell densities found in solid tumors. These spheroids will then be injected into the collagen in proximity to the vessel. After applying hemodynamic simulating flow through the engineered vessel, angiogenic sprouts from the vessel will be quantified via confocal microscopy to verify the device’s ability to mimic tumor-induced angiogenesis. Additionally, the modeling program COMSOL will be utilized to increase the efficiency of device development. Computational modeling will be utilized to determine the optimal concentration of spheroids, dimensions of the engineered vessel, and spatial relations between the vessel and spheroids. An in vitro kidney-tumor-on-a-chip capable of mimicking the tumor-vessel microenvironment would be a low-cost, simple, and accurate model to significantly aide in the development of new cancer-curing therapeutics. Nate is a senior majoring in Computer Science with departmental honors. His research interest is the area of programing languages, particularly formal methods and automated reasoning. Before starting at the University of Washington, he attended a research conference on a scholarship and met his current research advisor, with whom he shortly began research. In his first quarter at the University of Washington, he began research, audited a graduate course in the theory of programming languages, and joined several graduate-level research seminars and readings groups. To date, his research has focused on developing new algorithms and techniques to make program synthesis (i.e., the automatic generation of a software implementation given a high-level specification) scalable when using the promising new methodology of a solver-aided domain-specific language. With the support of the Washington Research Foundation Fellowship, Nate will explore a new research direction: how to combine the strengths of the two prevailing styles of automated reasoning for program synthesis and (especially) program verification (i.e., checking that a program provably implements its specification correctly). These two styles are (1) limited but fully automated constraint-based reasoning and (2) powerful but barely automated formal reasoning. After completing his B.S., he will remain at the University of Washington for another year to complete an accelerated M.S. in Computer Science & Engineering. After that, he will pursue a Ph.D. in Computer Science and finally a career in research. Abstract: Complex tree computations are prevalent in computer science, but they can be very tricky to get right. Incorporating incrementality, approximation, and/or parallelism makes implementation vastly harder, but such features are needed for their immense improvements to performance and energy consumption. This research aims to create a synthesis procedure to automate the generation of high-performance code, augmented with such functionality, for the class of tree computations expressible as an attribute grammar. In addition, this synthesis procedure will be formally verified to ensure its correctness and usability for sensitive or safety-critical applications.